Just three days before Christmas, everything is about peace and love and family and the true meaning of this holiday that has become so commercialized and in many instances, has lost its true meaning. Over the years, my family has slowly moved from all the traditional pieces of celebrating Christmas: we stopped putting out the manger display, we don’t go to church, and we don’t go all out on the decorations anymore. Even though there are a few traditions that I miss (seeing A Christmas Carol every year at the Playhouse, going to Louisiana to do a gift exchange with my mom’s family), being home for the two weeks at the end of the year with my family has begun to take on a significance in a new way that I cherish and value so much more than eggnog and playing Christmas music throughout the house. It’s things like the entire family sitting squeezing together on a loveseat in front of the tv day after day, drinking our coffee, playing on our iPads, watching Law & Order, and giving some TLC to the dogs. It’s things like all of us making gelato together, going through old boxes of memories and photographs as my parents pack for California, and taking a walk around the neighborhood in the freezing cold together. To us, Christmas has become less about the trimmings and the presents (although we still give them of course!) and the madness that comes with the holidays, and really has become more about what it was meant for — to show each other love and support, to be there for each other as family and friends. We’re excited for Mom’s new job, and the move across the country, we’re cherishing what may be our last year or so with Harrison as he grows older, and enjoying a rascal of a puppy that has brought us so much joy since Casey’s passing. We’re looking for new opportunities together, and reminding each other of what’s important – to love, be loved, and to be happy and healthy, doing what we love, and not letting others dictate our lives. And of course, making sure we get a big ol’ Honey Baked ham for Christmas dinner! ← Stumped on what to give this year? Try these ideas. 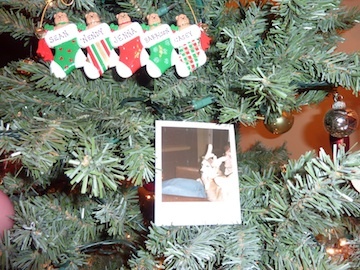 I like how you remember your beloved pup by placing his photo on the tree. Great idea. Wishing you a blessed Christmas this year!